To heal the disease of the patient the most important person is the physician. In the second tantra of the Tibetan medical texts the whole of the 31st chapter is on the practicing physician. When discussing the physician, the Tibetan medical texts have six categories. 1) The analytical mind which has learnt the four medical tantras and has developed some intuitive knowledge. 2) Compassion : possessing a good heart to treat all patients equally, as if treating their own mother. If you treat a patient with genuine compassion there is definite healing power. Otherwise, even if you are the best qualified physician, if your heart is not good there will be less success. In Tibetan society it is common for a person to go to a spiritual practitioner for a divination in order to know which doctor is right for them. This means finding which one is the most suitable and which they have a karmic connection with. There are instances where one person sees two different physicians who prescribe the same medicine, and yet one is more beneficial than the other. 3) Medical ethics and commitment to their practice. They must have respect for their gurus, teachers, medical instruments and fellow physicians. They should have no revulsion when seeing the pus, blood, urine, faeces and vomit of the patient. It is very important for the physician to keep the patient’s confidentiality They must consider all the medicines and medical scriptures as wish fulfilling jewels, and ensure that all the medicines have been blessed according to proper Buddhist rituals. 4) Patience: the physician must be very patient in body, speech and mind. Patience through the body is making medicine, patience through speech is by making the patient happy, relaxed and comfortable, and patience through the mind is by being alert and able to accurately diagnose and treat the disease of the patient. 5) Effort and concentration : continuous effort is required to learn and gain more experience, and the concentration required when seeing a patient is the same as the concentration needed by a person who is walking on a wall with a bowl of melted butter on their head, and who is threatened with death if they spill a single drop. 6) Wisdom : the physician should be both gentle, approachable, have a good sense of humor and they should be contented and helpful towards the destitute. 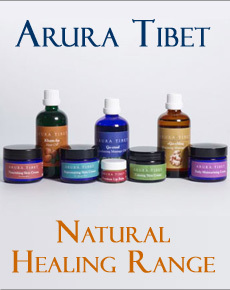 In Tibet the tradition was that there was no fixed price for treatment and medicines prescribed by the physician. If the patient was rich they could offer gold, silver, horses and other fine possessions, if the patient was middle class they would offer money and if the patient was poor the treatment was free. Because of this throughout Tibetan history no poor patient has died from disease simply because they could not afford to pay for the medication. The physician should know by heart the causative factors of diseases and their proper treatment. The description of the physician is one who heals all pain and practices medicine to promote good health. In the reign of Songtsen Gampo the 8th century Tibetan king, doctors were known as Lha-je, the king’s king. In Tibetan there is a saying that although you do not wish to bow to a physician you have to, as you do not know when you might need their help. Illness afflicts rich or poor with no discrimination. The different types of physician are divided into topmost, special and ordinary. 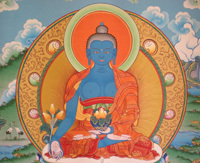 The topmost are like the Medicine Buddha, possessing omniscient knowledge. The special possess intuitive knowledge and they are able to generate strong compassion to help the suffering of the patient. The ordinary physician must have an authentic link with their teacher, otherwise they resemble a fox seizing a king’s throne; without a link with a teacher they will be no respect. The physician must have studied the Four Medical Tantras, otherwise it is like showing material objects to someone who is blind; they will not know how to treat and diagnose disease. A physician with no skills or experience is like someone on an unknown path; they will have no confidence and they will be full of doubt. A physician who is unable to diagnose illness is like someone wandering in a foreign country without friends; they will be unable to distinguish a single disease. A physician who is unable to read the pulse or perform urinalysis is like a spy unable to send their secret message; the physician will not know whether the patient has a cold disease or a hot disease. A physician who is unable to comment on, or predict the outcome of disease is like a chieftain who cannot give a speech to his clan; the physician will gain a bad reputation. A physician who does not know how to treat their patient resembles someone who shoots at a target in the dark; they are unable to get any response from their efforts. A physician with no knowledge of diet and conduct is like a king who is opposed by his subjects; the patient eats the wrong food and does the wrong things which in turn weaken their bodily constitution. A physician who cannot prepare medicine is like a farmer who does not how to cultivate the land; wrongly prepared medicine can disturb the whole system and cause various side effects. A physician who cannot prepare cathartic medicinal compounds is like someone pouring water onto sand where nothing will come out; if emetics are being used they are not working. A physician with no medical instruments or who is without medicine is like a courageous warrior going to war with no weapons; the physician is unable to eliminate any diseases. Finally the physician who has no knowledge of blood letting and moxibustion is like a thief in a house who has no knowledge where the valuable things are stored; the physician cannot use the moxibustion and blood letting points of the body. The medical texts say that is important to avoid such physicians, they are said to be like demons of death in the guise of doctors. In the context of Tibetan medicine in the West I have met people who claim they have studied Tibetan medicine merely from attending a few workshops or lectures. People should therefore be cautious and not taken in by glossy advertisements which they might see in a magazine. The best recommendation is always from a patient who has taken and benefited from the treatment. It is important to always investigate thoroughly and check on the qualifications of a physician. Physically they should try to collect as much medicine as possible in order to prescribe the right kind of medicine for disease, they always think about the needs of the patient and they should always be available. Verbally they should be able to predict whether the disease of the patient is curable or not. Mentally they should possess the six perfections of generosity, ethics, patience, effort, concentration, wisdom. The short term results of being a good physician are that you will be happy as it is one of the most rewarding professions in which you will meet many wonderful people from all walks of life. If you practice ethically it is said in Tibetan that a good doctor will never starve and will gain many good friends. The long term results of being a good physician are that if you are fully motivated and concentrated on healing patients you will achieve enlightenment in this life just through treating patients. It is the most practical way of helping others. 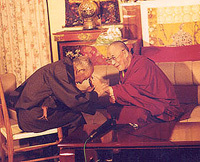 His Holiness the Dalai Lama once told his personal senior physician Dr Tenzin Choedrak that it was not necessary for him to spend his time doing religious practice, rather it was far more important for him to spend his time researching and developing new forms of medicine to relieve the human sufferings of the modern age.